This little one still has her cord attached and is soaking up all the benefits. Lately some of the women with whom I work, have been advised by their doctor that their babies umbilical cord should be cut immediately after birth to prevent jaundice. While I respect these doctors, in this particular case I do not believe that they are practicing evidence based care. Evidence-based practice means using quality scientific information for making a judgment. By identifying well-conducted research and applying it to practice, health care providers can improve the quality of care to mothers and babies. Something that everyone involved wishes for! There is a large amount of scientific research showing the benefits of baby receiving the cord blood. *As an added bonus, delayed cord clamping keeps babies in their mother’s arms, the ideal place to regulate their temperature and initiate bonding and breastfeeding. The only concern with delayed cord-clamping is a possible increase in hyperbilirubinemia, more commonly known as jaundice. To fully understand this situation one must understand that there are two situations where jaundice is present… normally occurring jaundice which happens in a natural birth without any inventions known as physiological jaundice. Jaundice in this circumstance will resolve itself without the need for treatment. Non physiological jaundice arises when medical interventions, medications crossing into the placenta and premature birth occur. This type of non physiological jaundice requires special consideration and neonatal help, but is very treatable. Treatment involves exposure to sunlight & phototherapy. Below I have included a research study which summarized the available research. It was published in 2007 in the Journal of the American Medical Association. It is important to note that there has been a large of amount of research done of this topic and the studies consistently note that the significant benefits outweigh the possible detriment of allowing the cord to finish pulsing before it is cut. I urge everyone to do their own research on this important issue, so that you can decide what’s best for the wellbeing of your child. Context With few exceptions, the umbilical cord of every newborn is clamped and cut at birth, yet the optimal timing for this intervention remains controversial. Objective To compare the potential benefits and harms of late vs early cord clamping in term infants. Data Sources Search of 6 electronic databases (on November 15, 2006, starting from the beginning of each): the Cochrane Pregnancy and Childbirth Group trials register, the Cochrane Neonatal Group trials register, the Cochrane library, MEDLINE, EMBASE, and CINHAL; hand search of secondary references in relevant studies; and contact of investigators about relevant published research. Study Selection Controlled trials comparing late vs early cord clamping following birth in infants born at 37 or more weeks’ gestation. Data Extraction Two reviewers independently assessed eligibility and quality of trials and extracted data for outcomes of interest: infant hematologic status; iron status; and risk of adverse events such as jaundice, polycythemia, and respiratory distress. Data Synthesis The meta-analysis included 15 controlled trials (1912 newborns). Late cord clamping was delayed for at least 2 minutes (n = 1001 newborns), while early clamping in most trials (n = 911 newborns) was performed immediately after birth. Benefits over ages 2 to 6 months associated with late cord clamping include improved hematologic status measured as hematocrit (weighted mean difference [WMD], 3.70%; 95% confidence interval [CI], 2.00%-5.40%); iron status as measured by ferritin concentration (WMD, 17.89; 95% CI, 16.58-19.21) and stored iron (WMD, 19.90; 95% CI, 7.67-32.13); and a clinically important reduction in the risk of anemia (relative risk (RR), 0.53; 95% CI, 0.40-0.70). Neonates with late clamping were at increased risk of experiencing asymptomatic polycythemia (7 studies [403 neonates]: RR, 3.82; 95% CI, 1.11-13.21; 2 high-quality studies only [281 infants]: RR, 3.91; 95% CI, 1.00-15.36). Conclusions Delaying clamping of the umbilical cord in full-term neonates for a minimum of 2 minutes following birth is beneficial to the newborn, extending into infancy. Although there was an increase in polycythemia among infants in whom cord clamping was delayed, this condition appeared to be benign. If you wish to understand this issue on the deeper level, I recommend reading the following 2 articles. One by an OBGYN who blogged about this topic. This article is particularly good to print out and give to your doctor. The second is by Dr. Sarah Buckley. I have included the beginning of the article, but follow the link to read it in its entirety. This paper was first published in Lotus Birth Shivam Rachana, Greenwood Press, Melbourne Australia 2000. A new expanded version of this article, which updates all information and adds information about cord blood banking, cord clamping with caesarean birth and a list of recommendations for a gentle third stage, is published in Sarah’s Gentle Birth, Gentle Mothering: The wisdom and science of gentle choices in pregnancy, birth, and parenting. Medical interference in pregnancy, labour and birth is well documented, and the negative sequellae are well researched. However, medical management of the third stage of labour- the time between the baby’s birth, and the emergence of the placenta-, is, to my mind, more insidious. At the time when Mother Nature prescribes awe and ecstasy, we have injections, examinations, and clamping and pulling on the cord. Instead of body heat and skin-to-skin contact, we have separation and wrapping. Where time should stand still for those eternal moments of first contact, as mother and baby fall deeply in love, we have haste to deliver the placenta and clean up for the next ‘case’. Medical management of the third stage, which has been taken even further in the last decade, with the popularity of ‘active management of the third stage’ (see below), which has its own risks for mother and baby. 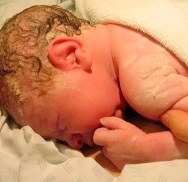 While much of the activity is designed to reduce the risk of maternal bleeding, or postpartum haemorrhage (PPH), which can be a serious event, it seems that, as with the active management of labour, the medical approach to labour and birth may actually lead to many of the problems that active management is designed to address. 1. Ceriani Cernadas JM, Carroli G, Pellegrini L, Otaño L, Ferreira M, Ricci C, Casas O, Giordano D, Lardizábal J. The effect of timing of cord clamping on neonatal venous hematocrit values and clinical outcome at term: a randomized, controlled trial. Pediatrics. 2006 Apr;117(4):e779-86. Epub 2006 Mar 27. 2. De Marsh, Q. B., et al. “The Effect of Depriving the Infant of its Placental Blood.” J.A.M.A. (7 June 1941). 3. Saigat, Saroj, et al. “Placental Transfusion and Hyperbilirubinemia in the Premature.” Eds. 49:3 (March 1972). 4. Rabe, H; Reynolds, G; Diaz-Rossello, J. Early versus delayed umbilical cord clamping in preterm infants (Cochrane Review). Chichester (United Kingdom): John Wiley and Sons; 2006. 5. Usher R, et al. “The Blood Volume of the Newborn Infant and Placental Transfusion”. Acta Paediatr 1963;52:497-512. And finally a great ted talk on this subject. If you enjoyed this post, you might also like these two articles as well. The white stuff you see on baby’s back and head is vernix. The thicker it is the more you can see it. Here are several abstracts on the antibacterial properties of vernix. There’s a good reason why babies should not be bathed right away after birth. 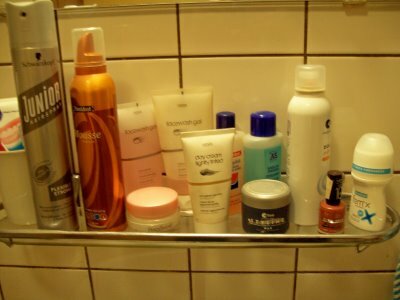 Can what’s on the shelves in your bathroom hurt you? Here is the curious answer. QUITE POSSIBLY. You simply can’t assume safety testing on any personal care products. Why is that? Well currently, Health Canada does not require any company to prove that their product is safe by any independent testing before it hits the market. Researchers have to proof something is unsafe before it gets pulled off the shelves. That’s why bisphenol A was common in baby bottles for years until enough research showed that it is harmful. The makers of bisphenal A never needed to prove that it was safe before they added to products. Doesn’t that seem backwards to you? It sure does to me. Keep Reading. The OBGYN-resident respected my wish to delay clamping until the cord stopped pulsating (or she said it had anyway)- which was only about 1-2 minutes after my baby was delivered. Because my husband and I had chosen to do cordblood banking, I was concerned that there wouldn’t be enough blood to fill the vials. (However, I reasoned that it was more important for my baby to get these vital stemcells at the time of his birth, something that likely will benefit him now and throughout his life). It turned out that there was enough blood for the cordbanking, even after delaying clamping. I was happy about this, but the Buckley article seems to suggest that if you delay clamping then there won’t be enough cordblood to bank? I did read an article by a labour and delivery nurse who said that she always finds there is enough blood for banking after delayed clamping – she said that sometimes you just need to “milk the placenta” after it is delivered. Thanks Marie for the info on this important topic, and for including my article. My new book has an update of this with alot more information about the pros and cons of cord blood banking. I would urge families to read the whole chapter before deciding on this issue, which medical research (and most profesoional bodies) shows is very very very unlikely to be useful to the baby or family. seconds of birth—so that an adequate number of stem cells is obtained. lower volumes, although this may not guarantee usefulness.